I’ve been working around Microservices for years, but only recently I did start wondering about how everything ties together. My experience at TransferWise helped me to start looking deeper in this world. More specifically, as we move from a monolith to micro services and huge scaling I wanted to know how all the different tools and processes came to be. This book is exactly what I was looking for to get answers about all that. The book talks about a variety of things, ranging from CI, CD, monitoring, security to scaling and breaking the monolith. 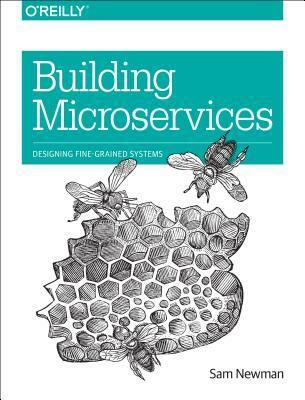 It’s a great introduction to micro services ecosystem and a great first point of getting deeper in the rabbit hole. The entire book was very good, but some chapters were more informative, for me, than others. As you can see from the notes below I really got a lot out of Chapter 11 that talks about scaling services and Chapter 8 that talks about monitoring. Chapter 9 about Security was good too. The notes below are separated in the chapters they belong. It doesn’t mean they are the only interesting part of the chapter or the book, it just what drew my attention more. Things I thought I need to remember for the future. Defining clear attributes that each service should have is one way of being clear as to where that balance sits. One of the key ways to identify what should be constant from service to service is to define what a well-behaved, good service looks like. What is a “good citizen” service in your system? What capabilities does it need to have to ensure that your system is manageable and that one bad service doesn’t bring down the whole system? Our practices are how we ensure our principles are being carried out. They are a set of detailed, practical guidance for performing tasks. They will often be technology-specific, and should be low level enough that any developer can understand them. architects have a duty to ensure that the system is habitable for developers too. When you’re starting out on a new codebase, this is probably a good place to begin. So once you have found your bounded contexts in your domain, make sure they are modeled within your codebase as modules, with shared and hidden models. This pattern—of implementing a reader able to ignore changes we don’t care about—is what Martin Fowler calls a Tolerant Reader. If the transaction manager goes down, the pending transactions never complete. This approach relies on all parties halting until the central coordinating process tells them to proceed. This means we are vulnerable to outages. The most common algorithm for handling distributed transactions—especially short-lived transactions, as in the case of handling our customer order—is to use a two-phase commit. In many ways, this is another form of what is called eventual consistency. Rather than using a transactional boundary to ensure that the system is in a consistent state when the transaction completes, instead we accept that the system will get itself into a consistent state at some point in the future. To see these database-level constraints, which may be a stumbling block, we need to use another tool to visualize the data. A great place to start is to use a tool like the freely available SchemaSpy, which can generate graphical representations of the relationships between tables. Automate everything, and if the technology you have doesn’t allow this, get some new technology! Next, if possible, move to a single-service per host/container. First, focus on maintaining the ability to release one service independently from another, and make sure that whatever technology you select supports this. The tool I’ve used the most for this is Fabric, a Python library designed to map command-line calls to functions, along with good support for handling tasks like SSH into remote machines. Pair it with an AWS client library like Boto, and you have everything you need to fully automate very large AWS environments. Track inbound response time at a bare minimum. Once you’ve done that, follow with error rates and then start working on application-level metrics. As always with standardization, tools can help. As I’ve said before, the key is making it easy to do the right thing—so why not provide preconfigured virtual machine images with logstash and collectd ready to go, along with application libraries that let you talk to Graphite really easily? This fake event we created is an example of synthetic transaction. We used this synthetic transaction to ensure the system was behaving semantically, which is why this technique is often called semantic monitoring. Instead, we’re looking to use specialized subsystems to grab our logs and make them available centrally. One example of this is logstash, which can parse multiple logfile formats and can send them to downstream systems for further investigation. With just a few hosts, though, we can use tools like ssh-multiplexers, which allow us to run the same commands on multiple hosts. A big monitor and a grep “Error” app.log later, and we can find our culprit. We may even get advanced and use logrotate to move old logs out of the way and avoid them taking up all our disk space. If we want to run our own monitoring software, we could use something like Nagios to do so, or else use a hosted service like New Relic. Second, this is a pattern, not a standard, and thus there are divergent ways of implementing it. As a result, there is a dearth of good, open, and usable implementations of this approach. There are three downsides to this approach. First, both the client and server need a shared secret that needs to be communicated somehow. How do they share it? With HMAC the body request along with a private key is hashed, and the resulting hash is sent along with the request. The server then uses its own copy of the private key and the request body to re-create the hash. If it matches, it allows the request. An alternative approach, as used extensively by Amazon’s S3 APIs for AWS and in parts of the OAuth specification, is to use a hash-based messaging code (HMAC) to sign the request. Another downside is that traffic sent via SSL cannot be cached by reverse proxies like Varnish or Squid. Authorization is the mechanism by which we map from a principal to the action we are allowing her to do. Generally, when we’re talking abstractly about who or what is being authenticated, we refer to that party as the principal. authentication is the process by which we confirm that a party is who she says she is. Swagger lets you describe your API in order to generate a very nice web UI that allows you to view the documentation and interact with the API via a web browser. Partition tolerance is the system’s ability to handle the fact that communication between its parts is sometimes impossible. At its heart it tells us that in a distributed system, we have three things we can trade off against each other: consistency, availability, and partition tolerance. Specifically, the theorem tells us that we get to keep two in a failure mode. If you are lucky enough to have fully automatable provisioning of virtual hosts, and can fully automate the deployment of your microservice instances, then you have the building blocks to allow you to automatically scale your microservices. Caching can be used to implement resiliency in case of failure. With client-side caching, if the downstream service is unavailable, the client could decide to simply use cached but potentially stale data. We could also use something like a reverse proxy to serve up stale data. let’s imagine we fetch a customer record, and its ETag comes back as o5t6fkd2sa. First, with HTTP, we can use cache-control directives in our responses to clients. These tell clients if they should cache the resource at all, and if so how long they should cache it for in seconds. In a situation where you have multiple types of clients, a server-side cache could be the fastest way to improve performance. With server-side caching, everything is opaque to the clients; they don’t need to worry about anything. Caching is a commonly used performance optimization whereby the previous result of some operation is stored, so that subsequent requests can use this stored value rather than spending time and resources recalculating the value. The Command-Query Responsibility Segregation (CQRS) pattern refers to an alternate model for storing and querying information. With normal databases, we use one system for performing modifications to data and querying the data. With CQRS, part of the system deals with commands, which capture requests to modify state, while another part of the system deals with queries. In a relational database management system (RDBMS) like MySQL or Postgres, data can be copied from a primary node to one or more replicas. Another model is to make use of read replicas. A more common model would be using a standby. All data written to the primary database gets copied to the standby replica database. If the primary goes down, my data is safe, but without a mechanism to either bring it back up or promote the replica to the primary, we don’t have an available database, even though our data is safe. The need to change our systems to deal with scale isn’t a sign of failure. It is a sign of success. A VLAN is a virtual local area network, that is isolated in such a way that requests from outside it can come only via a router, and in this case our router is also our SSL-terminating load balancer. The only communication to the microservice from outside the VLAN comes over HTTPS, but internally everything is HTTP. Some load balancers provide useful features. A common one is SSL termination, where inbound HTTPS connections to the load balancer are transformed to HTTP connections once they hit the instance itself. having a single microservice per host is certainly preferable to a multiservice-per-host model. If operations are idempotent, we can repeat the call multiple times without adverse impact. In idempotent operations, the outcome doesn’t change after the first application, even if the operation is subsequently applied multiple times. The Chaos Monkey is just one part of Netflix’s Simian Army of failure bots. The Chaos Gorilla is used to take out an entire availability center (the AWS equivalent of a data center), whereas the Latency Monkey simulates slow network connectivity between machines. "Response time/latency: How long should various operations take?" "Availability: Can you expect a service to be down?" "Durability of data: How much data loss is acceptable? How long should data be kept for?" This is actually an example of a strangler application, where a new system intercepts calls made to legacy applications and gradually replaces them altogether. Designed by George Stefanis in London, using Jekyll. Subscribe via RSS. My PGP public Key.